Foreign policy magazine has published Failed States Index and Yemen was ranked at the sixth no. after it was at the 13th no.! Though Yemen's festering terrorist threat is the country's most visible problem, hunger is a far more pressing issue for the population as a whole. The rate of hunger in the country doubled between 2009 and 2012, according to the World Food Program, and rising food and fuel prices amid political turmoil have compounded these dire circumstances. As of May 2012, 10 million people -- 44 percent of the population -- did not have enough to eat, and 5 million needed emergency aid. The country is also rapidly depleting its water supply; the capital could run dry in the next decade, and in some cities tap water is only intermittently available. While Yemen has climbed from 13th to eighth to sixth in the Failed States Index since 2011, there are signs of a turnaround. The country has been a leader in seeking a peaceful, negotiated transition from the turmoil of the Arab Spring. A cross-section of society has been meeting in a luxury hotel in the capital since March, working out a political plan for the future. President Abdu Rabbu Mansour Hadi, who assumed office in a one-candidate election in February 2012 following President Ali Abdullah Saleh's resignation, has also stepped up cooperation with the United States to fight al Qaeda in the Arabian Peninsula, which operates in Yemen's undergoverned regions. The number of drone strikes in Yemen reached a peak of 42 in 2012, and earlier this month the Yemeni military launched a new offensive against al Qaeda strongholds. 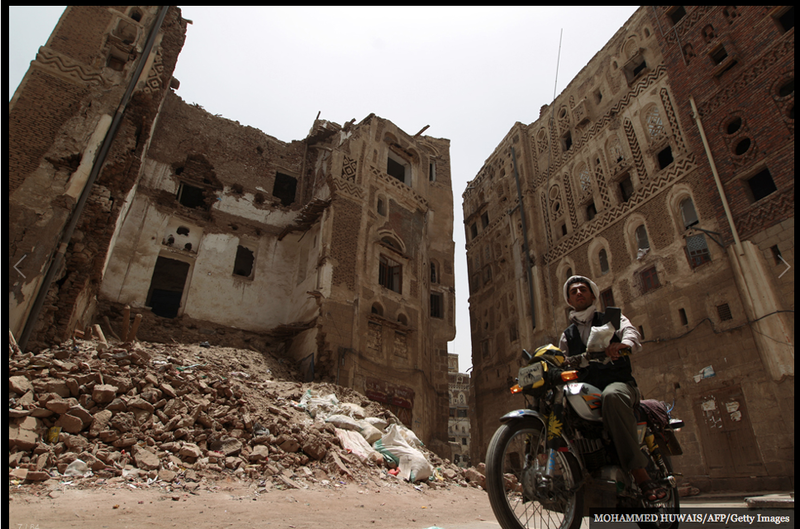 Above, a Yemeni man rides a motorcycle past a damaged house in the historical quarter of the Yemeni capital, Sanaa, on June 3, 2013.